United Nations (IANS): UN Secretary-General Antonio Guterres is following the situation in the subcontinent where the Indian Air Force struck a terrorist base inside Pakistan territory and is calling for “maximum restraint” by both countries, his spokesperson Stephane Dujarric said on Tuesday. 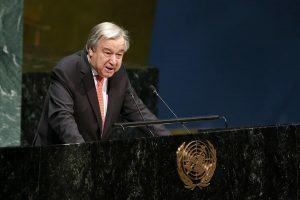 Guterres is on his way back to New York from Geneva and Dujarric told reporters, “I spoke to the Secretary-General not long ago, before he boarded his plane. He is obviously following the situation very closely and reiterates his urgent appeal to both the government of India and the government of Pakistan to exercise maximum restraint to ensure that the the situation does not further deteriorate”. India has not officially given a number for those killed at the Jaish-e-Mohammad (JeM) base in Pakistan’s Balakot beyond a statement by Foreign Secretary Vijay K. Gokhale that “a very large number of JeM terrorists, trainers, senior commanders and groups of jehadis who were being trained for fidayeen action were eliminated”. Pakistan has denied that there were casualties and asserted that the bombs hit an uninhabited area. A suicide bomber attacked a Central Reserve Police Force convoy in Pulwama on February 14 in Kashmir killing 40 troopers. Pakistan-based JeM terror organisation has said it had carried out the attack. In Tuesday’s retaliation for the attack, IAF Mirage 2000 fighter jets backed by an Emb 145 early warning aircraft struck the JeM base in Balakot in Khyber Pakhtunkhwa, 195 km from Islamabad and over 40 km from Muzaffarabad, capital of Pakistan-administered Kashmir.